Is there anything better than waking up to the intoxicating smell of sizzling bacon wafting into your bedroom and warming the whole house on a lazy Saturday morning? There isn’t, so bring home the bacon today with the all-new Chemical Guys Crunchy Bacon Air Freshener and Odor Eliminator! Like happiness and coziness rolled up, salted, cured, and fried, bacon is the cure to all your problems, and now it’s available on demand. Just one spray will get your mouth watering and all your senses tingling. Like a mini explosion of deliciousness with every spray, Chemical Guys Crunchy Bacon Air Freshener and Odor Eliminator infuses all your stinky spaces with the addicting scent of everyone’s favorite guilty pleasure. Bacon isn’t just breakfast; it’s an experience. It tingles all the senses from your mouth to your nose to your eyes to ears. With just one spray of the all-new Chemical Guys Crunchy Bacon Air Freshener, you’ll practically taste the cured pork melting like butter in your mouth. Close your eyes and you can almost feel the texture of the perfectly cooked bacon strips rolling over your tongue- not burnt and crispy, but also not raw and still saying “oink”... the perfect crunchy in-between. Squint a little and you can just about see the ribbons of red and white meat adorning your grandmother’s ancient jet black cast iron pan with tiny white grease bubbles oozing out the sides of each fat strip. Listen closely and hear the snap, crackle, and pop of the bacon slowly searing in its own fat on the burner... It’s a feeling, a memory of your childhood, a form of time travel to those times you thought long gone, and now it’s available on demand. 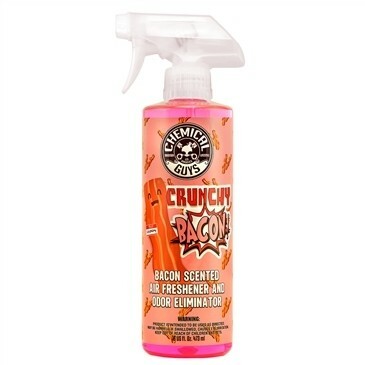 Pick up the Chemical Guys Crunchy Bacon Scent today for instant salivation!